During a routine wellness exam in April 2007 for all three of our dogs Randall asked the vet to run the Coccidioides profile. Although he had been in Flagstaff the year prior and the dogs all seemed to have high energy, running, playing and digging in the great Hassayampa basin on a daily basis they also had the highest exposure. The titers came back at 1:4 for the male golden retriever “Hobie” and 1:32 for the female golden “Maya”. But the heeler mix had no titer. Interestingly “Maya” did have some questionable symptoms just not the typical lung cough. She had intermittent diarrhea and would limp from time to time then stop. She began to get diarrhea when placed under any stress and seemed to move somewhat stiffly from time to time. When we went back to the vet it was strongly advised that the dogs be put on the fluconazole. Many vets will even treat titers as low as 1:2. Randall discussed with the vet the idea of using an alternative protocol and closely monitoring the dogs to determine if the situation was worsening or under control. 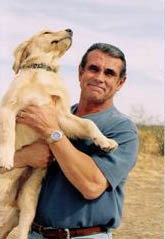 By 2008, after successfully managing the disease in his dogs and researching the nature of Valley Fever with its limited treatment options available and the fact that many humans and animals must sometimes live for years on the antifungal medications, Randall decided it was time to try and create an alternative for people and their pets. He took the basics of the protocols he had designed and made a formula that was far stronger than the individual supplements he had used. This would create the synergism of everything working and acting together instead of the limitations of different pills, assimilation and absorption times. He also knew he needed to work outside the arena of his own pets and designed a study to test the formula. We will be publishing the results of the laboratory diagnostics of these dogs and others that are enrolled in the study in the Case Studies section. Keep watching for updates to this section and updates on the Valley Fever formula.